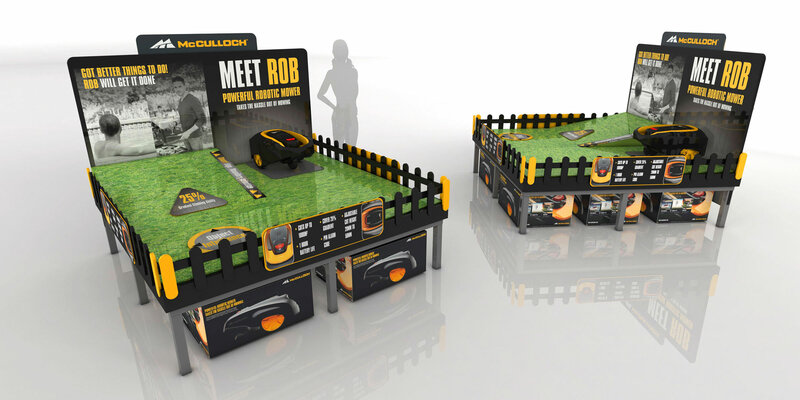 McCulloch recently entrusted Cirka with their 2017 product launch after the design team won a three way creative pitch, to create the brand’s new robotic mower displays for ( “ROB”) and their power tool range “Power~LiNK” across Europe. Working with the McCulloch’s brand marketing team, Cirka’s designers took and evolved a top level comms idea into engaging and educating retail comms package. This allowed a consistent messaging to be communicated across a range of POS displays and stands of varying budgets, in multiple languages. Cirka’s extensive and wide range of manufacturing materials base allowed the team to tailor material to each and every unit. Beautiful dibond double side direct printed back panels were used to achieve the structural integrity on one unit to hold the product without the need for metal back panels and cross bars, increasing impact and reducing costs. Learn more about McCulloch’s Powerlink range here.